My first posted embroidery project. I am relatively new to this type of stitchery, but I think these are reasonably good, considering. I wanted something my BF and I could wear to our first rock 'n' roll dance class (next week), so I chose polo shirts because they are fairly casual, but I also wanted my guy to wear a collar. I figured that since they are cotton and have a little give, they are a good choice for lessons. I wanted a bit of a cheese factor but did not want to break out the 50's rock icons until we have learnt a few moves. The results. Mine. 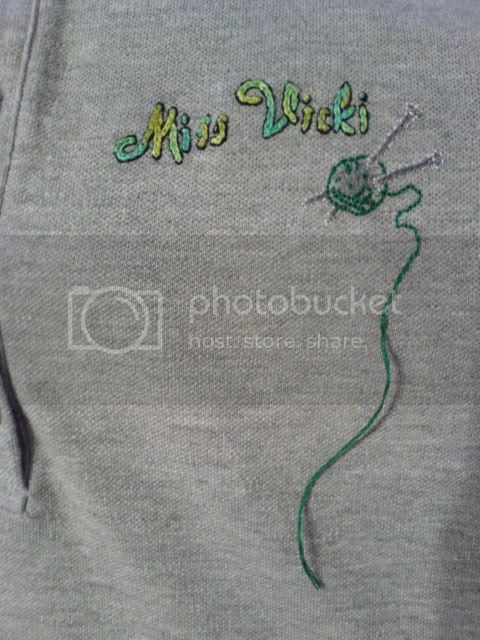 Name is in chain stitch with back stitch outline. Yarn and needles in back stitch. I must confess that the yarn ball is only there to help disguise the tacky stitches I had to employ in order to fix the hole I made, when I unpicked to machine embroidery that was already on the shirt. 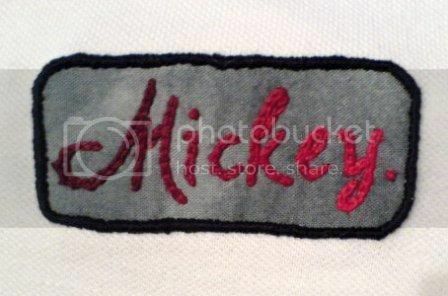 Not a good idea to buy a shirt with pre-existing machine stitchwork! I will never do this again! As for the needles, I was not convinced that my yarn ball would be identifiable without them. I suspect I was right. His. This really is a patch. I like that look and I am glad I had decided to go with it. Especially after I discovered the folly in trying to remove those little machined logos manufacturers seem to deem as essential (I did not find a single embellishment free polo on my shopping trip, but yeah I know they exist). I worked this up on a scrap of fat quarter cotton (with tear-away stabiliser), in chain stitch, both for the script and the outline. I then ironed it on to adhesive stabiliser, cut it out and ironed it to the shirt. The all I had to do was satin stitch it down (so easy when it is already so well secured). The chain stitch and extra fabric thickness made for the most pleasing satin stitch effect I have ever achieved. It is my suckiest stitch, I just seem to be neat enough. I am considering coping out and using outlines for this too in the future. Bonus wide shot showing tail of yarn ball. I just couldn't help adding this detail. It may not survive many washes, but I'm not bothered. If the tail gets ratty I can snip it off as I secured the thread before I left the tail hanging out front. Overall, I am pleased with these results. What is next, a circle skirt with a yarn ball on the hem, of course. Hand towels with our names on too, if I ever master stitching onto terry that is. I figure it would be poor dance hall etiquette to drip on your partner, even in lessons. So the towels should be a handy addition to our kit. Man, that terry is not easy though. Those look great. I love how you let the end of the ball hang freely. Sheesh! It's great! 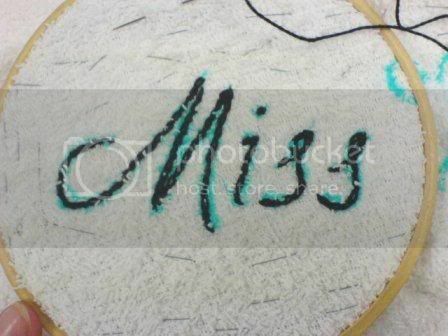 I love the way your name looks with the back stitch/chain stitch. I'm impressed! That looks really good! and I love the patch, every boyfriend should have one!! So cute! My husband was a dancer for ten years and even though I know there are many dance studios in town I just can't bring myself to sign up and be the clumsy one. Boys are supposed to be the clumsy ones! I love the shirts though. Have you tried getting yourself a hand towel with that strip of woven fabric in? That would be a much easier spot to embroider than in the pile of the terry. 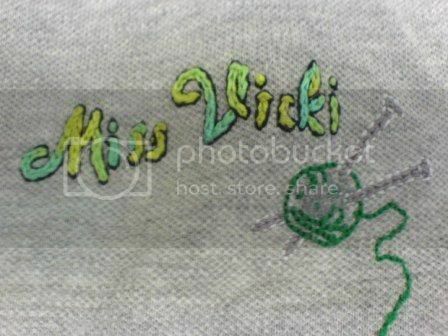 Or maybe you could applique the names on instead of embroider. I can't wait to see the circle skirt though! Definatly a place for some fice felt applique! I have seen those handtowels lady Lanalla. The ones I have sen had aida cloth for cross stitch inserted. I had not though of that forthis though. I just jumped right in and picked up basic ones for 90 cents or something from Ikea. The applique is a good idea too. I am happy to report though that I am making progress with the towels. I have switched from stranded cotton to the thicker plied stuff and I am using a way way bigger needle. I am still having problems with bits of the pile pulling out into big straggly bits, but I am finding I can make it work. The trick seems to be making sure I don't split any of the towel threads, especially the ones on the pile. Think this looks bad, you should see the satin stitch on be BF's towel. Oh boy. Don't sell yourself short! It looks lovely! Keep up the good work and make sure to post when you've finished! That is incredibly awesome. You are surely talented! Five stars for creativity, coolness and style! Etsy Shoppe: Blissed Out! by sharon-lizette designs. My craft, travel and vegan delites blog. Stop by and say hi! If I were you, I'd tack down the tail of the yarn ball. I've recently learned cording (it's not unlike couching) and if you are familiar with either technique, you can use it to keep the tail from unraveling. Looks like you've already used something similar on the first bit coming out of the yarn ball. If you do this, the tail will most likely survive washing.